I just spent a whole weekend repainting the furniture in our living room, I wasn't about to mess up all my hard work with water spots and stains, so I took some fabric scraps and made some coasters. Here's how you do it. I was going to measure a square, but I found this handy little cardboard template just laying around and decided to use that. It's from a fat quarter and it isn't square, but almost. I thought it would work perfectly. Then I pulled out some coordinating fabric that I had lying in my scrap bin and set to work. 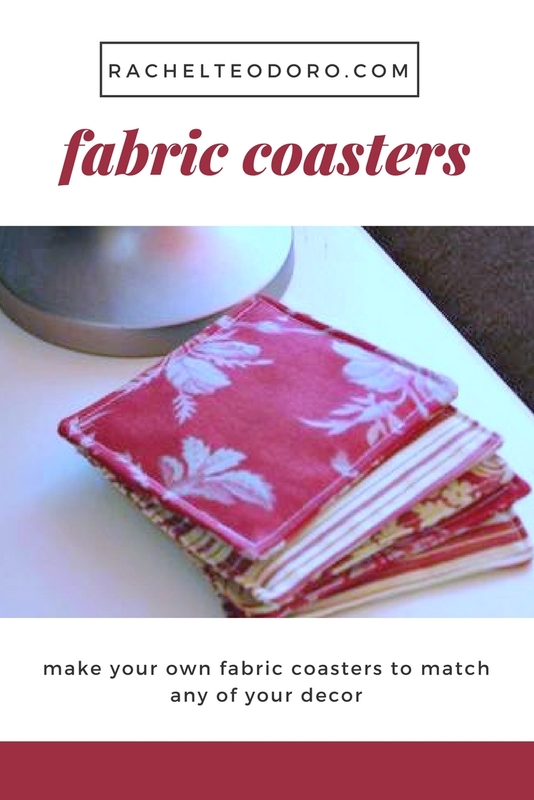 You need to fold your fabric in half (you need two of each piece to make one coaster) and use your template to cut the proper size. I cut out batting to go inside as well (cut that just a tad smaller on all sides). Put the two right sides together and place the batting on top of one side. Stitch around closely to the edges and leave a small hole for turning. Trim your corners before you turn, then turn your fabric, press the open seam down, pin in place and then stitch around the outside. That's it, you are done! Great...and would make great gifts! I am so happy to have you join in this week! Love them and love the fabric you picked!